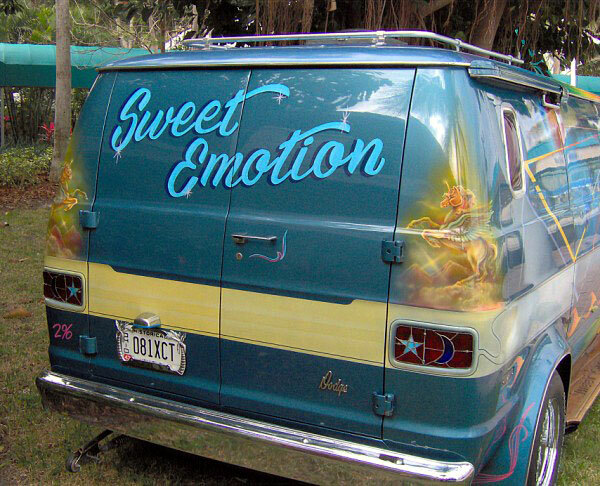 SWEET EMOTION IS ONE OF FLORIDA’S TRULY CLASSIC VANS. IT STARTED OUT LIFE IN 1975 AS A PLUMBER’S TRUCK BUT WAS ROLLED IN A SNOWY WRECK. 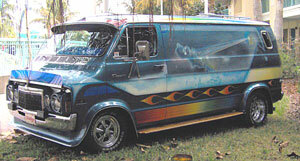 JUNIOR ACQUIRED THE VAN, REPAIRED THE DAMAGE AND PROCEEDED TO BUILD A CUSTOM VAN THAT WOULD BE A SHOW WINNER ANYWHERE. THE NAME “SWEET EMOTION” WAS A RESULT OF THE NAME THAT JUST “FIT” WHILE THE VAN WAS BEING BUILT. WHILE THE MAIN PART OF THE PAINTWORK IS OVER 25 YEARS OLD IT IS STILL IN BEAUTIFUL SHAPE DUE TO THE LOVING CARE THAT JUNIOR PROVIDES. POWER FOR SWEET EMOTION IS PROVIDED BY A CLASSIC DODGE MOTOR, THE 318. IT HAS 340 HEADS, HEMI CAM AND A HOLLEY 4 BARREL TO NAME JUST A FEW THINGS, POWER IS TRANSMITTED THRU A 727 MOPAR TRANSMISSION WITH A SHIFT KIT (OF COURSE). THE FRONT GRILL AND HEADLIGHT ASSEMBLY FROM A 1975 CHRYSLER CORDOBA (AH, FINE CORINTHIAN LEATHER). WHEELIE BARS IN THE REAR THAT ARE USED WHEN JUNIOR GOES A LITTLE WILD WITH THE FRONT HYDRAULICS (YES HE SAID THAT IT WILL BOUNCE THAT HIGH ) THERE ARE EXTRA HEAVY DUTY BATTERIES THAT POWER THE HYDRAULICS. LITTLE DETAILS LIKE THE PIN STRIPED DOOR JAMBS AND THE LEADED STAINED GLASS TAILLIGHTS SHOW THE ATTENTION TO DETAIL THAT WAS PUT INTO THIS REALLY FINE CLASSIC VAN. JUNIOR AND GLENDA ARE THE FIRST VANNERS TO HAVE HAD 3 VANS FEATURED AS COVER VANS FOR THE FVC. 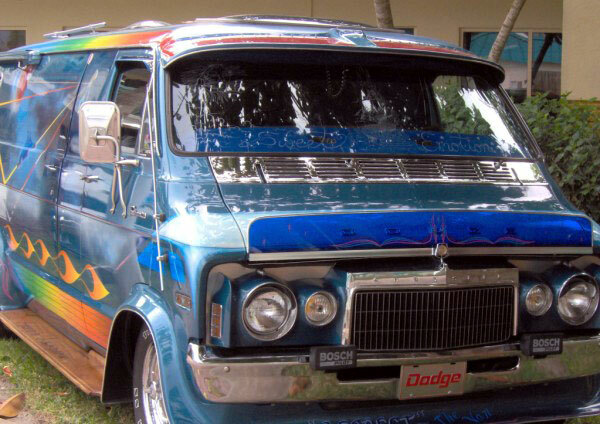 THEIR VANS ARE CLASSICS AND THEY REPRESENT THE TRUE VANNING SPIRIT WITH THEIR LOVE FOR THEIR VANS AND FOR THEIR FELLOW VANNERS.